Megan Frazer is poised to make a sooner-than-expected return to the Ulster Elks line up after being an unused sub in Saturday’s crucial 2-1 Premier League win over Rainey in Magherafelt. 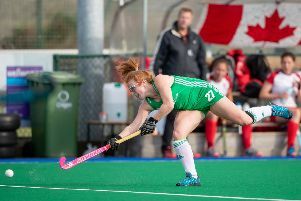 The World Cup silver medallist broke a bone in her hand just three weeks ago when Ireland were on a warm weather training camp in Chile. But she is set to make her comeback next Saturday when the Elks take on Ballymoney at the Joey Dunlop Centre before returning to German club Mannheimer next month. Yesterday’s was the only women’s game in the province to survive the wintry weather, helped by the fact it was played indoors at the Meadowbank Arena. 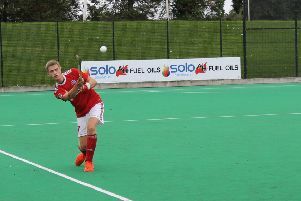 Joel Cathcart’s side are closing in on a top three finish which would be enough to secure a place in the second tier of the Irish Hockey League next season, provided Ards don’t get relegated from the top flight. The Elks remain in fifth place but are just two points behind Lisnagarvey following yesterday’s win as they extended their unbeaten run to eight matches. Anna Hutchinson broke the deadlock in the 25th minute from a penalty corner and then doubled the Elks’ lead with a superb solo effort midway through the second half. Rainey pulled one back with 10 minutes left when Charlotte Beggs converted a penalty stroke. Elks coach Cathcart declared: “It was just great to get the game played as we have a bit of catching up to do as this was only our second match since Christmas after beating Randalstown last week. Following yesterday’s loss, Rainey remain anchored to the bottom of the table but trail Ballymena only on goal difference. On the men’s scene, just two Ulster Premier games beat the frost as Kilkeel defeated Bangor by the seaside and Civil Service and Belfast Harlequins drew 0-0 at Stormont. In the game in Bangor, Ashton Graham put the visitors ahead after only 14 seconds before William Annett and David Finlay scored to make it 3-0. Bangor fought back well with goals from Matthew Willis and Chris Barnes but were unable to find an equaliser as the champions held on for an important win.